Your home’s doors could be so much more. Here are ideas to consider. The expression "thinking outside the box" suggests generating innovative solutions. We can apply this practice when considering home renovations, and today we're going to look especially at doors. Every home has doorways and doors, so instead of seeing these portals as basic structural necessities (maybe even annoyances) in the course of home redo, let's be creative. Consider the various aspects of household doors. They fall into a few basic categories: swinging, bi-fold, sliding or pocket. 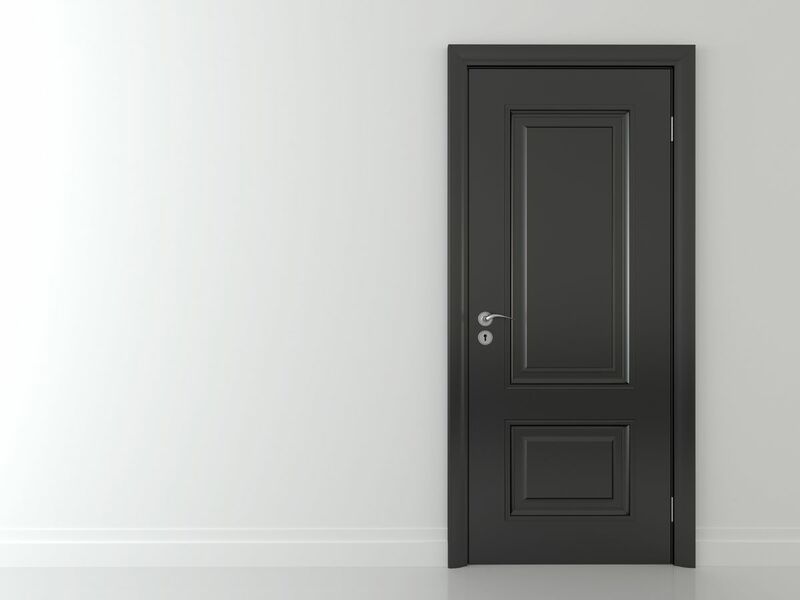 The function of a door, by definition, is to act as a barrier that covers an accessible opening. Yet when updating your home, look at ways to make the doors do more. Here are some creative ideas. First to consider are sliding barn doors … and these are no longer the barn doors of yesteryear found only in stables and other outbuildings. Creatively used inside with decorative rails and sliders, these interior barn doors can be used as artistic focal points or space saving solutions, when compared to traditional doors that swing open on a hinge. Think of the many Anchorage homes with master bedrooms that feature open, arched doorways between the master bedroom and bath. Or toilet nooks that are open to the entire bathroom. Many prospective buyers may object to this open concept due to the lack of privacy and the inability to dampen noise for those on different work schedules. So what can you do to update the open, arched doorway? Retrofitting with traditional remedies can be difficult. An arched door that fits the space can be expensive to build and install because of the specialty size. The hardware and trim needed for such a swinging door also decreases the opening, making it more difficult to traverse. A simple curtain or drape provides privacy, but doesn't help with the noise. Here's when sliding barn doors might be the solution. Some home renovation shows, and online sites, creatively use sliding barn doors in different sizes and configurations. Think beyond the "traditional barn door." Make this a door with attitude. Depending on the material, these sliding doors can be artistic focal points, providing texture and interest while serving multiple purposes. One side of the door creates privacy, while the other side might have a mirror or a chalkboard. The hardware is space saving, by not intruding into the room as a swinging or bi-fold door would. These sliding barn doors can be made to look like pieces of art, with a variety of shapes and sizes. Imagine a freeform slice of a tree trunk with the bark and wood knots left exposed as part of a barn door covering the arched doorway mentioned above. The hardware itself can also create a visible artistic point, or be discreet and hidden. Different materials and designs can easily fit your décor. The hardware can also handle the weight of a solid core door, which deadens sound, while handling the weight along a rail. As these sliding doors can be purchased or made in different dimensions and shapes, and they allow use in various locations in a home. For example: Sliding doors can allow easy access into a pantry, be used to hide a small under-stair storage area or even for doorways where two swinging doors continually bang together; a smaller version can be a discreet way to cover a TV in a cabinet; a tiny slider can even cover a peephole in a door. Next, kitchen oven doors have also been given a new creative twist – instead of the door lowering down in front of the oven, some now open up like a swinging door (right or left), have double French door openings, or tuck under as a "slide and hide" retractable door. Any of these solutions solve the safety concerns we've all felt leaning over a very hot oven door to retrieve something from inside. Finally, someone thought outside the box and applied the popular soft-closing mechanism found in kitchen drawers to give the pocket door a new look and feel. Instead of the pocket door clumsily rolling on a closet slide, the updated technology gives the pocket door a soft opening and/or soft closing. No more slamming the door to either open or close it. Even further adaptation connects the opening/closing to a light switch for hands-free on/off. No more closing the door and leaving the light on. So if you want to add a little unexpected style to your next home update, think creatively about those accessible openings. Do something with these portals that hasn't yet become common place in new construction.